Sanlian LifeWeek, “one of the most widely circulated weekly magazines in China with 300,000 readers per week in more than 30 Chinese big cities” contacted me last week to get my views on the visit to India by US President Barack Obama. According to the journalist who wrote to me, the magazine is published by Sanlian Publishing House, which was founded in the 1930s and is one of China’s largest publishing houses of long history. Since it is rare for an Indian journalist to speak to Chinese readers, however briefly, I was more than happy to provide my two fens worth! 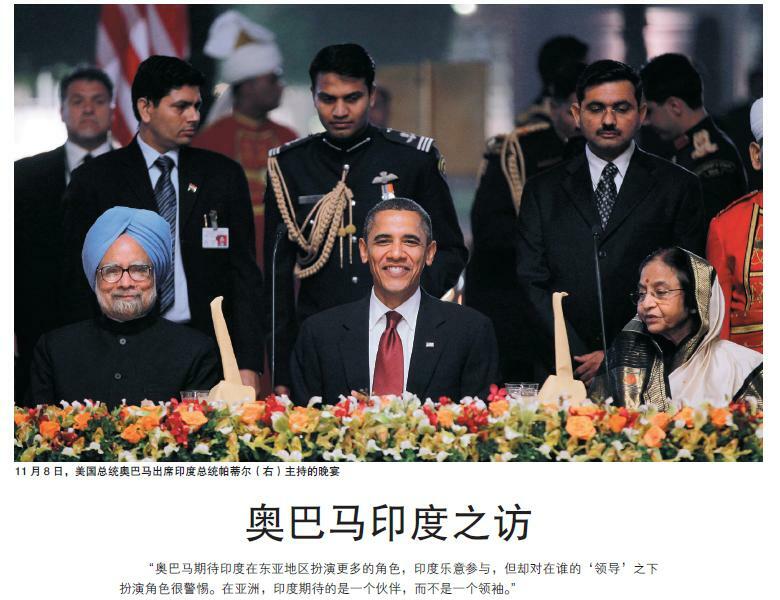 Question 1: Many Chinese analysts are less optimistic than India media about Obama’s present visit. It is widely believed here while Obama gains economic benefits substantively from this trip, India only gets symbolic gesture from Obama’s supporting India’s political ambition to become a permanent member of Security Council. Obama’s trip is motivated by economic interest, while India expects political gains. How do you see this gap? How do you see what this trip has brought to the US and to India? Varadarajan: The United States has three main objectives in developing closer relations with India and these were the focus of President Obama’s visit. The first is to gain economic benefits from commercial and military deals. This goal was only partially fulfilled. $10 billion worth of Indian commercial deals were announced but many of these were previously agreed. As for defence, the big contract for 126 fighter aircraft has yet to be decided between the US, French, Russian and European vendors. The second goal was to dispel the idea that the Obama administration was less committed to the strategic partnership than George W. Bush was. On this front, he was successful, particularly by making the announcement of support for an Indian permanent seat at a future, expanded UN Security Council, and by endorsing the Indian positions on terrorism and the need for a ‘step by step’ dialogue with Pakistan where easier issues are taken up first. The third goal was to encourage India to work closely with America in the East Asian region and help Washington better manage the uncertainties stemming from China’s rise. On this front, he was only partially successful. The Indians are happy to expand their role in Asia and East Asia but are wary of doing so under the “leadership” of anyone, especially the Americans. Nor do they want to be seen as American “allies”. The Indian goals from the visit were also three-fold. First, to make a further dent in the high technology-denial regimes and complete the process started in 2005 with the Indo-US nuclear deal. On this front, India achieved some successes. Three of its companies were taken off the US Entities List, Obama promised that India would be treated the same as other American friends and a commitment was made to push for Indian membership of multilateral export control regimes like the NSG and the MTCR. The second goal was to achieve a better convergence of views on regional security issues, especially terrorism, Pakistan, Afghanistan and Iran. Here, India was only partially successful. Obama came away with a better understanding of India’s concerns on terrorism emanating from Pakistan and also of the importance of India’s role in Afghanistan. But the US President remains too trustful of the Pakistani military and too distrustful of diplomatic options with Iran, from the Indian point of view. The third goal was to win greater US acceptance of the global role that India aspires to play. This was met with success: the US endorsed India’s candidature for a permanent Indian seat and also spoke of working together with India to have a dialogue with other states possessing nuclear weapons (such as Pakistan, China, Russia etc) on nuclear doctrines. It is true that the promise of a UNSC seat is open-ended and, in a way, conditional on India playing the part of a “responsible stakeholder” from the American viewpoint. But Obama’s endorsement will create space for India to push its cause more effectively. Question 2: The New York Times analyzed Obama’s Indian trip as a necessity to counter assertive China. One example in case is the large scale military deal with India. But to many Chinese analysts and experts, in real politics, this is not true. Do you think the U.S. and India take each other as a strategic democratic partner to counter China in Asia? Varadarajan: It may be simplistic to characterise American policy towards Beijing as one of “countering China”. Yes, the US is worried by what it sees as growing Chinese assertiveness. So are many countries in Asia, especially India, Viet Nam etc. The US also makes a lot of noise about the lack of transparency in Chinese defence policy and defence spending. In reality, the US is by far the strongest military power in the world and has been using its armed might in Asia for several decades, often with very negative consequences for the region (eg. Viet Nam war, Iraq war of 2003). The US and Chinese economies are closely intertwined but this does not mean there is no strategic rivalry. Power for both the Chinese and the Americans means the same thing: no restriction on their own freedom of action and the ability to deny that complete freedom to others. During the Cold War and after, the US relied on a network of allies to project its power in Asia. Today, America itself may not be in decline but some of these allies, especially Japan, are in decline. The thrust of US policy over the past 15 years has been to build a new network of partnerships that can sustain American hegemonic interests in Asia. And Pentagon planners believe India has the potential to be the most important of such partners, given its military capability, democratic culture and regional and even global aspirations. To this end, the Pentagon has been encouraging arms sales and inter-operability with the Indian military and also been pushing for access to Indian bases. The Indian side, however, is wary. They would like access to the latest American hardware and are keen to benefit from military exercises but they do not intend to serve as a junior partner in such a project. 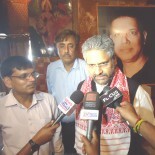 There is resistance within India to signing agreements like the Logisitcs Support Agreement and CISMOA. And while many Indians are wary of Chinese military power and feel the need to grow Indian capabilities as a counter or hedge, there is no support for a military gang-up with the US against China. Most see such a strategy as dangerous for the region. Question 3: Historically, India holds an independent policy towards many issues and seldom follows the U.S. As some Indian scholars put, India has its own global strategy and is not interested in any kind of military alliance. What is your opinion? How do you see the U.S. and India’s divergence in issues like US’s AfPak policy and towards Iran, and more broadly, their Asian version? Varadarajan: There are some in India who would like the country to work more closely on global issues with the United States but the overwhelming majority support an independent foreign policy. This means that just as there will be issues on which we will work with the US, there will also be issues where we will work closely with other countries and this may also mean taking stands and positions that run counter to what the US wants. We have seen this on the world trade talks issue (Doha round), as well as on the climate change issue. Even on Iran, the Indian position today is at variance with the American one. India does not believe sanctions and coercion are the way forward, for example. Differences may also crop up on the question of Asian security architecture when it becomes clear that the US intends not to work as a partner of Asia and East Asia but seeks to lead and direct it. But here, it is important for Chinese readers to understand that hardline Chinese policies and attitudes, especially when it comes to territorial disputes and boundary questions, are making it easier for the American side to push its role and even “leadership” in Asia. The US would like nothing more than to be able to play on the insecurities and fears of China’s neighbours. My son would like to reproduce this article on his blog. Is it ok for him to do that – of course he would post it along with a credit and a link to your blog. Sorry sending a message this route – I don't have your email address. On a completely different topic, how come you have not written anything on Niira Radia tape? I just spent an hour going through the Niira Radia tape transcripts and also the rebuttal by NDTV in defense of Barkha. I must say that to a layperson like me, NDTV's rebuttal is completely beside the point, the transcript speaks for itself. It is truly disappointing and confirms my belief that absolute power corrupts absolutely be it in politics, corporate world or the media, I am particularly disheartened how the journalist community – save a few like Rasheeda Bhagat – have chosen to live in a collusion of silence. Would love to hear your view if you are able to share …. Interesting how you went a little ahead to allay the possible fears of Chinese readers in the last question. I am looking forward to your views on the issues of 2G allocation and media's new lovebird – Corruption in govt. Excellent Excellent & Simply Excellent. Loved the way you summarized in simple and understandable language. You can convert Chinese in English by using Google translator. This entry was posted on November 17, 2010 by Siddharth Varadarajan in China, Indian Foreign Policy, U.S. Policy in South Asia.